The Agulhas Current is the western boundary current of the South Indian Ocean’s subtropical gyre. It carries tropical and subtropical waters poleward, along the east coast of South Africa, between about 27 S and 37 S. South of the continent, at about 40 S, it retroflects to the east and becomes the Agulhas Return Current. 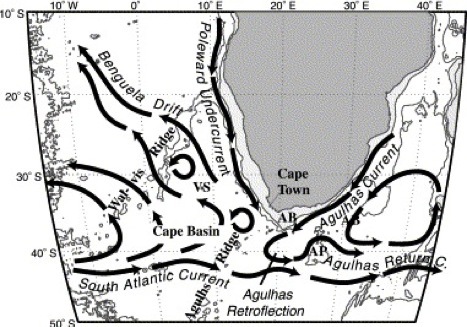 The Agulhas Current, Johann Lutjeharms, Springer, 2006. What was the difficulty with measuring longitude at sea? What is the geostrophic reference layer problem? How would you expect geostropic velocities and direct velocities to differ and why? What does synoptic mean? Which kind of oceanographic data are synoptic? What problems can arise if measurements are not synoptic? Does Agulhas Current transport match Sverdrup theory? Discuss why or why not?